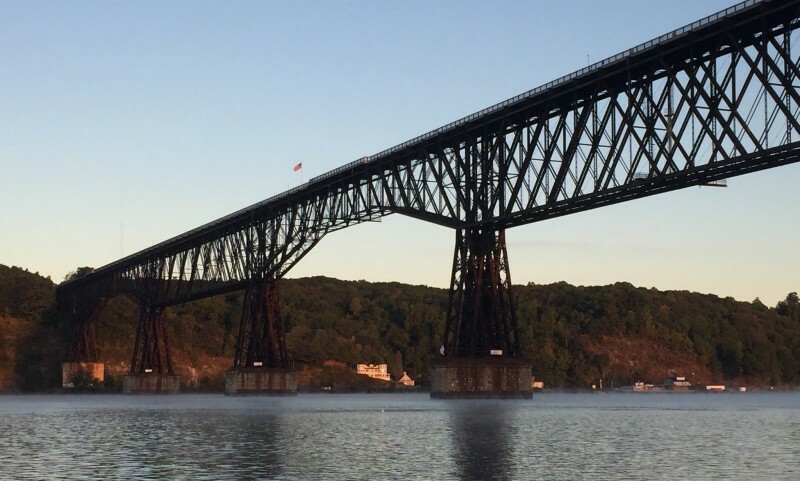 A former railroad bridge built in 1888, the Walkway spans 1.26 miles and stretches 212 feet above the majestic Hudson River. Connecting Highland on the westside and Poughkeepsie on the east, it's the longest, elevated pedestrian bridge in the world. Enjoy a magnificent birds' eye view of the Hudson, Catskill Mountains and adjacent landscape. It's ideal for walkers, joggers, cyclists and rollerbladers. No skateboards or motorized vehicles are allowed and there are no equipment rentals on site. Parking is available on both ends of the bridge. The Walkway is wheelchair accessible and motorized scooters are allowed for the handicapped only. It's about a 15 minute walk from the Poughkeepsie train station to the Walkway stairs at Washington Street. The Walkway also features a glass elevator that operates seasonally, at UpperLanding Park on the Poughkeepsie waterfront - a 5 minute walk from the train station. Pets are allowed but must be on a leash no longer than 6 feet. Owners are required to clean up after their pets and waste bags and trash receptacles are available at either end of the bridge. This is an smoke and alcohol free park. The Walkway Over the Hudson State Historic Park opened in October, 2009. This park is managed and maintained by the New York State Office of Parks, Recreation and Historic Preservation. For questions about park regulations, vending permits, events and special requests, contact NYS Parks Walkway Over the Hudson phone line at 845-834-2867; office hours 8am-4:30pm. Open daily 7am - sunset, year round. 2018 Pavilions Open April 1 - November 25th Saturday's and Sunday's from 10:00am - 4:00pm weather permitting.